Autumn is coming and with it our rivers are beginning to wake up. The weed is beginning to thin, and the water levels are rising. Soon, those stretches that have slept all summer will be sparkle with every shower and thicken with fish. 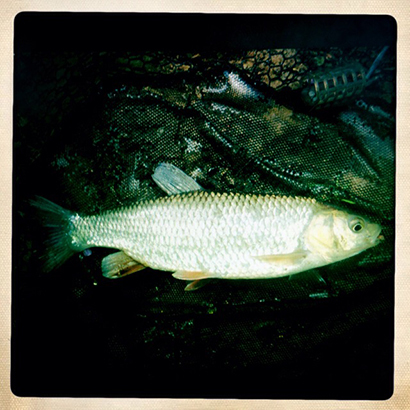 The chub (Squalius cephalus) is surely the epitome of a river fish. They may not fight as hard as a salmon or barbel, but they are wily, and know every snag in the river. Give them an inch and they’ll be gone. The best thing about chub though, is their predictable unpredictability. Izaak Walton wrote of their fearful nature, and a clumsy cast or heavy footfall can scatter a shoal in seconds. Yet they can be wound up and teased and if treated with thought and respect, seem almost kamikaze.